Freckles to Toes: Do you Dry Brush? 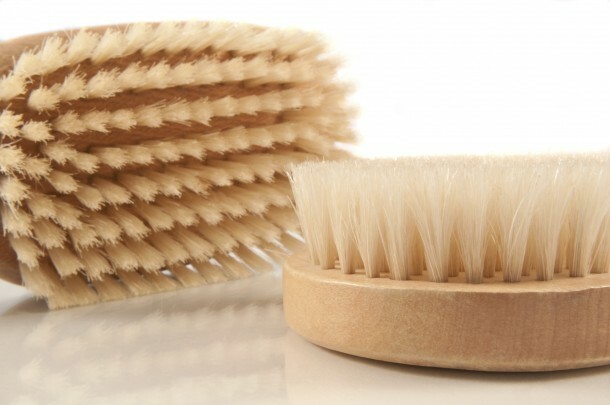 The health claims for dry brushing are numerous, and include: the ability to tighten skin, reduce cellulite, stimulate circulation, increase cell renewal, open pores, aid lymphatic system in detoxification, remove dead skin layers, reduce ingrown hairs and strengthen the immune system. These all sound a tad extreme for a little bristle action, except perhaps removing dead skin layers. That one I buy. The basic tenants of dry brushing are to start with your feet and work your way up, always brushing towards your heart. One caveat that all dry brushers warn against is the use of synthetic fibers. Plant fibers such as tampico, coco or sisal bristles are specifically recommended by converts. What I do like about the concept of dry brushing for exfoliation is the elimination of another product, another plastic jar and another batch of potential chemicals. For such impressive claims it seems like a safe enough experiment. Are you a skeptic? Or are you tempted?